As we look around, one subject on the minds of many of you is that of the building of new housing estates in various areas around the district. I thought, therefore, I should have a look historically at some of the estates we have with us today. However, these estates were built during the natural expansion of the district, rather than by instructions from the government. If we first look at West Meads, the news headlines were not much different to those appearing today. ‘700 more homes for Bognor Regis’ were the headlines of the Bognor Regis Post in October, 1961. This particular report advises the reader that this was to be the largest single development in West Sussex at the time, and was created on a 130-acre site, which was former farmland. It is interesting to see the wording used at this time. “Apart from the sheer size of the development, two features mark it – the way the bungalows are being set out, and their completeness as living units’, it stated. One feature that, of course, we would like today was the price that these were being sold at ‘£4,275 apparently without any hidden bills’. What could be hidden you may ask? Apparently, in 1961, it was to have extra power points, cupboards and adequate paths! One feature that was advertised was the thermal insulation being used to retain heat and another was ‘the rooftop television aerials’. The services provided by this ‘piped service’ that would allow for ‘colour broadcasts, Radio Luxembourg and any new techniques of sound and television transmission which may come about’. But all this new development was not totally welcomed. One report stated that the West Meads estate, was ‘a mistake in planning and sent the area of Bognor sprawling into Rose Green and beyond’. Today, of course, West Meads is a very established part of the community. I am aware that there are groups and organisations still in existence today that commenced as people moved into the estate during the 1960s. I am also certain that there are many people living on the estate who moved into their first home at West Meads, and who still enjoy their life there. Another estate in the 1960s that was advertised extensively in the press was that of the Glenwood Estate, which apparently was going to ‘create a traffic hazard’. The publicity, which was also sent to prospective purchasers for this estate included a reference to its location and also reminded people that ‘it was chosen by eminent specialists as the place for the recuperation of His Majesty George V’. This development was to be constructed in a ‘self contained garden setting,’ and be a ‘premier development of freehold model bungalow homes’. Here there were to be two types of bungalows with a purchase price of £3,095 or £3,595 with each bungalow having a separate garage space. The builders were also going to include a parade of shops, similar to the offer for West Meads. When reading newspaper reports of new developments, the press always went into great detail regarding the layout of the property and internal facilities as well as the surrounding area. Another method used to both sell houses and encourage people to come to the area was in 1957 when the Daily Herald advertised ‘Free holidays for life’. The prize for this competition was to win a fully furnished seaside house and garden, by the beach. Part of the descriptive prose extols the virtues of the area with – ‘think of the South Downs, that rolling greenness of English countryside. Follow the road over sweeping hillsides and there before you lays Bognor Regis’. How could anyone resist entering this competition? I wonder who won the house? If we now cross to the Felpham area, we will also find a similar situation. Some of the sale particulars here place the area in a wider context. For instance, the sale particulars in 1958 for the Old Manor House, describe it as being a ‘well appointed old-world Sussex residence’. As well as providing the prospective purchaser with a description it also mentions that it is close to the Bognor Regis Golf Course, Goodwood and Littlehampton. We were also told that buses were available to the station and all parts of the south coast. Around this time was another development, that of the Long Meadow Estate. The headlines announce ‘An idea is born’. Here we learn that seven acres of farmland off the bypass between Bognor and Felpham was to be ‘transformed into a park like estate, rich in trees and lawns’. The architects and company involved wanted to create an area, which moved away from the regimented style of building, no monotony of building so that the houses and flats would be landscaped into an idealistic setting. Within the Felpham and Middleton area new estates tended to be advertised as being within their own environment, or as part of the wider Sussex area. 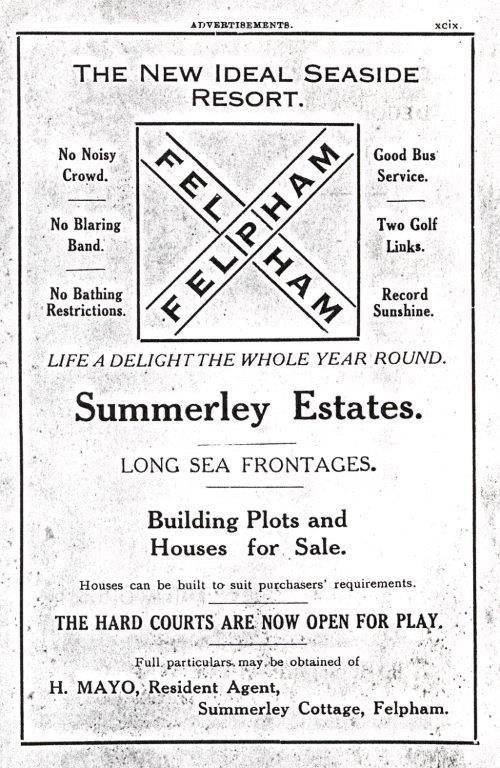 One undated advertisement for the Summerley Estate mentions that living there would be a delight the whole year round, principally because Felpham had – no noisy crowds, no blaring band, no bathing restrictions, in addition to a good bus service and record sunshine. This seems to me to be an area separating itself from a nearby seaside resort! What do you think? While down in the Middleton and Elmer area pictures were being shown of thatched cottages and advising new customers that theirs was ‘The Best Estates’. Here advertising continued with statements like, ‘old world village on the sea’. Today, I suppose the area would come under a new regime such as ‘modern constructions,’ or ‘period cottages in a quiet location’. We now have building occurring on the outskirts of Bognor Regis both from the Chichester entrance to the town and also on the Littlehampton entrance to the town. Whichever way estates have been advertised over the years, they have been filled with, in many cases, new arrivals to the area that have stayed to develop the area even further. Many estates were used for housing for Bognorians as the area expanded. Some of these new residents may even be involved in the expansion of estates today. Who knows! Whatever the final outcome of any of future proposals I must surmise here on the views and opinions that will be made by the local historians of the future! How will they derive our opinion of the way we have developed the area by the middle of the 21st century?